Northern Michigan is known by all for its exceptional natural beauty, enhancing and inspiring even the simplest everyday activities. Northern Michigan golf, as writes Lynda Twardowski Wheatley, is an especially impassioned and breathtaking activity set deep amidst the Northern Michigan outdoors. I have my grandmother’s feet. My mother’s smile. And my father’s golf swing. When done right—and, truthfully, it often isn’t—our swing is a languid arc, a calibrated crescent measured in the moments between exhale and inhale, when head, hips, shoulders, wrists, and knees domino in an unspoken hypothesis of motion: If this sways, then that bends. If that straightens, then this dips. If this lifts, then we rise. Then pause. One suspended arc watching another. But in the dozen years since I’ve moved Up North, I’ve come to wonder if my parroted swing is less a product of Dad’s tireless backyard engineering than it is a kind of chiasma, a genetic crossing over of not only Grandma’s muscled feet and Mom’s toothy grin but also the particular twist and tempo of Dad’s spine and tendons blueprinted onto mine. Wherever I’ve lived—the suburbs of Detroit, East Lansing, Los Angeles, Orlando—I’ve always golfed. Sometimes rarely; occasionally obsessively. In college, I played maybe twice. In L.A., a yearlong golf bender had me teeing up alone on an asphalt-locked Par-3 six mornings a week. Here in Northern Michigan though, golf feels different. Not the game itself, not the mechanics of play, but the spirit of it. Here, for me, each stroke isn’t singular. It doesn’t start at the address, the setup that lays the foundation of a shot. The stroke starts—they all start—when winter trickles into spring, when the warming earth sips the sluice of 18 ashen tundras until their fairways, ragged and pale and eternally hopeful, float to the surface. Inside me, some small black seed, hard-packed from a bitter winter of hunched shoulders and shivering, cracks open. Come summer, this thing inside me uncoils. As the days linger long into 10 p.m. sunsets, it thrives, sending out shoots and roots across and under fairways I have walked until, like a colony of aspens, it connects me not only to my dad but also to my entire family. Because of them, when I approach the tee Up North, my stroke has long since started. I’m not addressing the ball anew. I’m already in my upswing. I’m a continuation of my grandpa, whose figure-8-style swing was as legendary as it was potent. I’m a connection to my mom, who patiently toted my kid self through countless rounds even when I eight-putted every hole. I’m a descendant of my grandma and aunts’ unrepentant love for picnic golf, which is heavy on the golf but significantly heavier on the salami, cream cheese, and green onion roll-ups. And I’m a link in the chain that bonds my brother, my uncles, and my cousins—monster-drive guys, all of them—together. But most of all, I am—my swing is—my dad’s. I once explained to him that when I can’t sleep, I write sentences in my head, looping and pressing words together until my mind lets go of its real thoughts and fades into fantastically weightless ones. He told me that when he can’t sleep, he picks one of his favorite courses and mentally plays every hole from tee to pin, playing each ball as it lies in his mind’s eye. Now that I have a toddler, I don’t golf with my dad as much as I’d like. The last time we played, just the two of us, I was six months pregnant, a pendulum swinging its stem. Summer was dawdling, as it often does Up North. The evening was cool, and I was tired. A couple holes shy of finishing the front nine, I trundled back to our cart, plopped my feet on the dash, and told my dad I was done. I’d watch the rest of his round from there. He nodded, bent over, and sank his tee into the grass, then stepped back to assess: dog-leg to the left, two bunkers halfway, another wide maw at the lip of the green. When he dropped his shoulders to address the ball, I closed my eyes and listened, across and under the darkening fairway, beyond the cicadas’ buzz, for his exhale. I knew the rest. 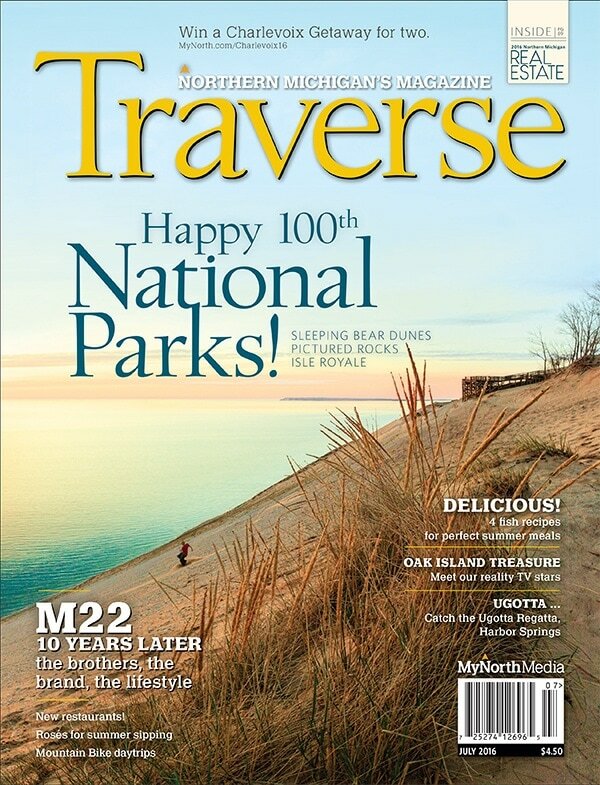 This Northern Michigan golf essay was originally featured in the July 2016 issue of Traverse, Northern Michigan’s Magazine.